1.3.4 What is a Contract? Welcome to the State of Hawaii Procurement Wizard (Procurement Manual). The Procurement Wizard is the official guide to the procurement process for goods, services, and construction. The State’s primary procurement resources include the Procurement Wizard, Hawaii Revised Statutes (HRS), and the Hawaii Administrative Rules (HAR). The Procurement Wizard is updated to reflect the specific revisions provided in a Procurement Circular. The Procurement Wizard is maintained in accordance with the State of Hawaii’s record retention requirements. Relevant Procurement Circulars have been incorporated into the Procurement Wizard. Revision History will be maintained as part of the Procurement Wizard. To aid the State’s Procurement personnel, the Procurement Wizard describes standard procedures and sound business practices that implement statutory requirements regarding purchasing Executive Branch goods, services and construction and health and human services. Maintaining ethics, quality and integrity in Hawaii public procurement. In addition to detailing procurement processes and practices, the Procurement Wizard presents a roadmap of the procurement process to guide agencies from start to finish through the various stages of the full procurement lifecycle. The guidance provided in this document governs all Executive Branch agencies subject to the Chief Procurement Officer’s authority pursuant to HRS 103D-203, unless specifically exempted by statute. Other statutory Chief Procurement Officer jurisdictions governed by Hawaii statutes, but not subject to the authority of the Administrator of the State Procurement Office, are encouraged to leverage this guide as a best practice. The Wizard does not refer to every section and paragraph of the Hawaii procurement statutes and rules. It is a general guide. When procuring, please ensure the relevant statutes and regulations are also reviewed. Resources tabs are located at the top of each section page. “Procurement” means buying, purchasing, renting, leasing, or otherwise acquiring any good, service, or construction. The term also includes all functions that pertain to the obtaining of any good, service, or construction, including description of requirements, selection and solicitation of sources, preparation and award of contracts, and all phases of contract administration, HRS 103D-104. Ultimately, it is the act of putting the people’s money to work in a way that upholds the people’s trust. The Hawaii Procurement Lifecycle, illustrated below, organizes the procurement process into a series of steps from the time the state entity first identifies a needed good, service, or construction through contract award, contract administration and contract closeout. The remaining departments of the executive branch of the State and all governmental bodies administratively attached to them–the administrator of the state procurement office of the department of accounting and general services. The semi-autonomous public transit agency–the director of the agency as designated by county charter. In the Wizard, generally references to the CPO means the Administrator of the State Procurement Office in the capacity as CPO for the Executive Branch unless otherwise indicated. In accordance with HRS 103D-104, “Procurement officer” means any person authorized to enter into and administer contracts and make written determinations with respect thereto. The term also includes an authorized representative acting within the limits of authority. State of Hawaii personnel involved in the procurement of goods, services, and construction have the responsibility to uphold Hawaii procurement laws and act in good faith to serve the best interests of the State of Hawaii and its taxpayers. The Code of Ethics for public officers and state employees in the conduct of procurement activities is detailed in HRS 103D-101(a) and further detailed in HAR 3-131-1.02, with penalties for violation prescribed in HRS 103D-106 and HAR 3-131-4. All public officers and state employees, not just procurement professionals, are expected to read and understand these key statutes prescribing proper conduct. Specific requirements applicable to all persons engaged in the procurement process are detailed in HAR 3-131-1.02, Procurement Code of Ethics. The provisions found in HAR 131 set forth the minimum requirements for ethical procurement, proscribe specific actions, such as parceling or “after-the-fact procurements” and set forth penalties for failure to comply. In addition, all State of Hawaii public officers and employees are governed by the State of Hawaii Code of Ethics as enforced by the State Ethics Commission. The laws setting out the Code of Ethics are contained in HRS 84. OFFER: A willingness to enter into a contract based on certain terms. When a state agency receives acceptable bids or proposals as part of a procurement, these qualify as an offer. ACCEPTANCE: A willingness to be bound by the terms and conditions of the offer. This includes the terms and conditions set forth in the procurement issued by a state agency that have become part of the offer, plus additions such as pricing and delivery terms. The State award of a contract would qualify as acceptance. CONSIDERATION: Anything of value promised to another in exchange for fulfillment of the offer. Typically, the state promises money in exchange for goods, services, or construction. CAPACITY: A party to a contract must have the ability to enter into a legal contract. In general, there are three classes of persons that lack capacity to be bound by contractual promises – minors, intoxicated persons and mentally incompetent persons. In accordance with HRS 103D-206, the State Procurement Office has implemented a training and development program to ensure that agency personnel involved in the procurement process are knowledgeable of the laws, regulations, and policies that govern public procurement in Hawaii. Prior to engaging in any procurement activities agency personnel are required to receive training and obtain delegation of authority to procure by the Head of the Purchasing Agency (HOPA). Agency personnel that are directly involved in the development of a solicitation, the execution of a procurement action, or the management of an ensuing contract are required to complete the appropriate training. Details of mandatory and recommended workshops are provided in the Procurement Training Requirements Table located on the SPO website. Most training is provided in an on-demand format to ensure agency personnel are able to access the training they require in a timely manner. Training workshops can be accessed from the ‘Training’ resources tab of each section and on the SPO On-Demand Training page on the SPO website. Throughout the Procurement Wizard, various forms are referenced for use in the procurement process specifically by the Executive Branch. SPO maintains a list of forms needed to conduct and document a procurement on the Forms tab of the SPO website. Additionally, the website maintains the latest version of each form and should be accessed before initiating a new procurement to ensure that the most current form is used and to avoid a disruption in the process. Forms may be located in the Templates tab of each section. 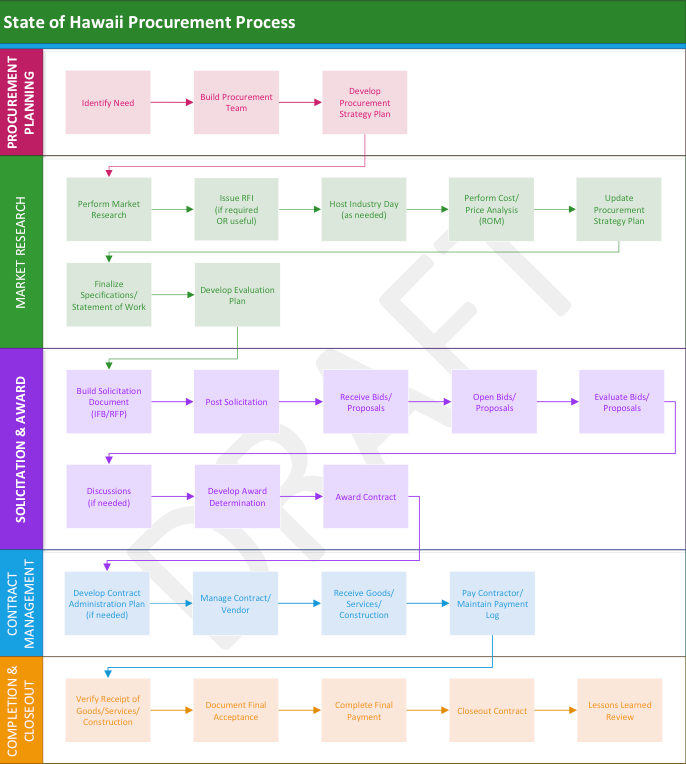 The organization of the Procurement Wizard is based on the Hawaii Procurement Lifecycle, outlined below, with individual sections dedicated to each of the five stages of the lifecycle. Each Section in the Wizard begins with a Key Information subsection that provides a general overview of the tasks associated with that lifecycle phase and provides links to tools and templates identified in the section. Following this overview, each section provides guidance and direction on how to properly execute the tasks associated with that phase of the lifecycle and continue workflow through the remaining phases. All references to purchases of Health and Human Services will be highlighted throughout this manual.